Add this store to favorites. Sign up for Store newsletter. RPM Powersports shop for parts and accessories. 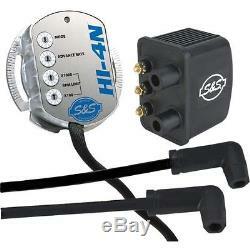 S&S CYCLE HI-4N IGNITION KIT W/ COIL AND PLUG WIRES FOR HARLEY SHOVELHEAD, EVO. 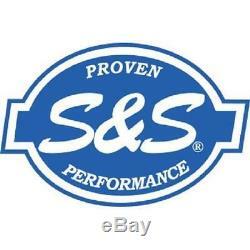 Performance ignition kit from the proven performance crew at S&S! More power than the stock ignition. Single-fire and dual-fire function built into a single module. All-metal housing provides improved heat dissipation. Ignition advance and timing degree markings are on the metal flange. Convenient cable notch in the housing makes installation easier and prevents damage to the cable. Sensor and magnet housings are built into the all-metal back plate to protect the sensors from damage during installation. Sensor housings contain advanced flux concentrators with high-temperature-resistant samarium/cobalt magnets for accurate, reliable ignition triggering. Electronics are fully enclosed to resist vibration, moisture and dirt. All electronics are mounted directly to the metal housing, which acts as a heat sink. Four rotary switches for ignition mode selection, advance rate, and rev limit. Switches provide accurate, repeatable settings. 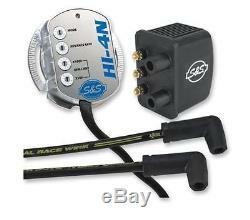 Includes ignition module, S&S ignition coil and spark plug wires. Note: Not for fuel injected models. ADDITIONAL REQUIRED PARTS (not included) , FX series Big Twin® and FL series Big Twin® models prior to 1985, and all models with OE points will require OE Part # 32402-83 or replacement timing rotor. 1000 Sportster Cafe Racer - XLCR. 1200 Fat Bob - FXEF. 1200 Low Rider - FXS. 1200 Super Glide - FX. 1200 Super Glide - FXE. 80 Electra Glide - FLH. 80 Electra Glide Heritage - FLH. 80 Fat Bob - FXEF. 80 Low Rider - FXS. 80 Low Rider - FXSB. 80 Super Glide - FXE. 80 Wide Glide - FXWG. Dyna Glide Custom - FXDC. Dyna Low Rider - FXDL. Dyna Super Glide - FXD. Dyna Wide Glide - FXDWG. Electra Glide Classic - FLH 1200. Electra Glide Classic - FLH 80. Electra Glide Classic - FLHTC. Electra Glide Special - FLHX. Electra Glide Sport - FLHS. Electra Glide Ultra Classic - FLHTCU. Low Glide Custom - FXRC. Low Rider Chrome - FXRC. Low Rider Convertible - FXRS-CONV. Low Rider Custom - FXLR. Low Rider Sport - FXRS-SP. Softail Night Train - FXSTB. Softail Springer Bad Boy - FXSTSB. Sport Glide Grand Touring - FXRD. Super Glide II - FXR. Super Glide II - FXRS. Tour Glide Classic - FLTC. Tour Glide Ultra Classic - FLTCU. The item "S&S CYCLE HI-4N IGNITION KIT With COIL AND PLUG WIRES FOR HARLEY SHOVELHEAD, EVO" is in sale since Thursday, August 24, 2017. This item is in the category "eBay Motors\Parts & Accessories\Motorcycle Parts\Electrical & Ignition\Other Electrical & Ignition". The seller is "rpm-powersports" and is located in Omaha, Nebraska. This item can be shipped worldwide.